Even if you're a pro at roasting the turkey, fitting everyone around the dinner table can be a real challenge—especially with unexpected guests. Read on to find out how your recycling bin can save the day! Unplanned guests can throw off even the most seasoned holiday host or hostess. Between checking on the turkey, wiping up spills, and keeping an eye on the kids, you might not even realize that you don’t have any seats left for your newest arrivals until dinner is served! If this sounds like your last Thanksgiving get-together, you’ll love this simple stool dreamed up by a designer at Makedo. The company, which already repurposes boxes to make everything from record players to raptor costumes, has now solved seating arrangement dilemmas by folding cardboard discards into spare chairs. It all starts with the recycling bin. The Makedo team recommends grabbing a tall, sturdy cardboard box (like those used to carry home wine or liquor) and scoring lines to form a tall isosceles triangles on each of its two narrow sides. They design a set of easy (and safe!) tools specifically for scoring, shaping, and cutting cardboard, but you could also attempt to follow the instructions using a pizza cutter carefully for this part. 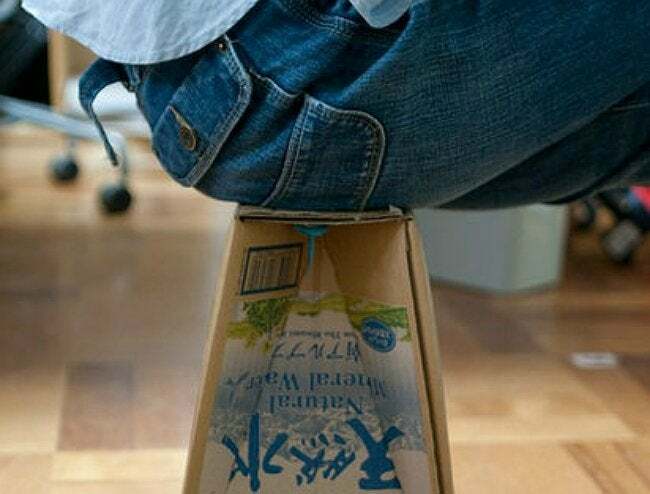 The box sides then fold in along those lines to create a sturdier stool shape. On top, punched holes 2 inches from either edge and Makedo Scrus or large brads reinforce the masterful cardboard origami. The team’s project successfully seated a full-grown man, but it’s best to test out the new stool to make sure it’s stable before handing it over to a guest for the duration of your big meal. When your party trick holds up and fits everyone around the table, you can get back to gobbling down dinner. You’ve earned your pumpkin pie!